Kicking off the spring season this weekend, the No. 20 men’s tennis team will compete in the Sherwood Cup in Thousand Oaks, California, while the No. 8 women’s team will send players to tournaments in Las Vegas, Nevada and Indian Wells, California. The Sherwood Cup will provide stiff competition for the Cardinal, as it includes men’s players from No. 4 Baylor, No. 8 USC and No. 14 UCLA. But if the team can carry last year’s success into the new season, the Cardinal should be up for the challenge, especially with sophomore Tom Fawcett at the top of the ladder for the second year. The men’s team had a breakthrough outdoor season in 2015, which included earning a share of the Pac-12 regular-season championship for the first time since 2010 as well as upset victories over Cal, USC and UCLA. Fawcett notched an outstanding winning record (26-12) as a freshman playing at the No. 1 spot and is currently ranked a career-high ninth in the nation, according to Oracle/ITA Collegiate Tennis Rankings. Fawcett will be warmed up for this weekend’s matches, as he competed just last week at the USTA Pro Futures of Los Angeles, where he advanced to the second round of the main draw before losing 6-3, 6-4 to No. 1 seed Tennys Sandgren. Fawcett entered the qualifying draw as the 12th seed and won three matches to reach the main draw. In the qualifying draw, Fawcett collected a notable win over No. 2 seed Raymond Sarmiento with a score of 6-3, 6-0. Sarmiento is a former ITA All-American who graduated from USC in 2014 and is currently ranked No. 480 in the professional world circuit. 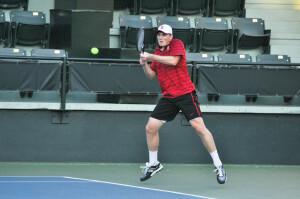 Stanford freshman Michael Genender fell one win short of qualifying for the main draw. Genender gave up only two games in his first two matches before losing 6-4, 3-6, 6-2 to Nicholas Hu in the final round of the qualifying draw. Following the tournament in Los Angeles, Genender notched two wins in the qualifying draw for the USTA Pro Futures in Long Beach, California. Also in the tournament, Fawcett started play in the main draw but fell in the first round 6-3, 6-0, 7-5. Other players who have earned significant victories in the last few months include sophomore David Wilczynski and seniors Nolan Paige and Maciek Romanowicz. Wilczynski won the singles title and Paige and Romanowicz claimed the doubles title at the men’s USTA/ITA Regional tournament on Oct. 26. The men’s team originally was scheduled to play a double header at home on Jan. 13, but that event was postponed to Jan. 20, due to forecasted rain. The Cardinal will host Sacramento State and UC Davis at the Taube Tennis Center for the double header to kick off the Cardinal’s dual match season. The Cardinal women, historically the most successful women’s collegiate program in the country, also look poised for another strong season. Five of six players have returned from last spring’s lineup, which reached the NCAA Quarterfinals, with only Ellen Tsay ’15 having graduated. Juniors Carol Zhao, ranked No. 1 in preseason polls, Taylor Davidson, ranked 20th nationally, and Caroline Doyle, ranked 39th, should help lead the Cardinal this season. Davidson and Doyle are the No. 10 doubles team in the nation. In the Freeman Memorial Invitational in Las Vegas, the Cardinal will be represented by senior Krista Hardebeck, sophomore Paulette Wolak and freshmen Caroline Lampl, Melissa Lord, Elizabeth Yao and Kimberly Yee. The Cardinal won the doubles title at the Freeman Memorial Invitational in 2014 and 2015. In Indian Wells, California, senior Lindsey Kostas, freshman Naomie Rosenberg, Davidson and Doyle will compete in the NCTC Classic. Davidson and junior Carol Zhao claimed the doubles title at the NCTC Classic last year. The Cardinal may miss the formidable presence of Zhao, who will not compete this week. Last year, Zhao was the NCAA Singles Championship runner-up and led the women’s team with a 35-5 overall record while playing all of her matches at the No. 1 spot. The women’s first dual match will be at home against Santa Clara on Jan. 22.